TAEGU, South Korea - The route to the gym is far from easy. The Soldiers stand waiting for the bus that will take them to two different military camps before getting off at their stop. Then they have to walk off post into the bustling streets of Korea, navigating across traffic. Entering a door wedged in between two small businesses, the Soldiers climb the hidden stair cases in order to train in jiu-jitsu. A small group of Soldiers with 19th Expeditionary Sustainment Command train after work in jiu-jitsu, a martial art system focused on ground fighting and grappling, with Korean martial artists, enhancing their combative training. Combatives is a style of hand-to-hand combat used by the Army. It consists of a mix of effective combat techniques from various martial arts styles. Soldiers use Brazilian Jiu-Jitsu grappling and throws, take downs from Judo and wrestling and strikes from boxing and Muay Thai. "Combatives is designed to protect yourself in hand-to-hand combat on the battle field," said Staff Sgt. Lizandro Gonzalez, the 19th ESC combatives team instructor and Miami, Fla., native. "It's broken down to the very basic level. The thing about Brazilian Jiu-Jitsu is that jiu-jitsu steers away from everybody having to do the same technique. Gonzalez has been going to the gym for the past six months and has even introduced one of his fellow competitors to the gym. Pvt. 1st Class Kaleb Whitten, an intelligence analyst with 19th ESC and Onalaska, Texas, native, approached Gonzalez in passing one day about jiu-jitsu. Whitten, who used to be a wrestle,r has been attending the school for 3 months. While the Soldiers are taking the opportunity to learn and develop their fighting skills, there are still barriers that they have to overcome. Most of the students do not know English and the instructor primarily teaches the class in Korean. "The instructor doesn't necessarily give instructions in Korean and in English," said Gonzalez. "A lot is left to your own interpretation, but I have enough experience where I can see the instructor do a maneuver and kind of make it out to be my own without having to be shown to the side." Whitten, however, is new to the sport and has developed his own method for learning from the instructor when Gonzalez is not available to break down the moves. "I'll watch the instructor and watch how he moves his body and how he maneuver his opponent," said Whitten, "After watching him a few times I learn how to perform the technique." Gonzalez has also found another way to communicate with the Korean students. As a purple belt, Gonzalez occasionally gets questions from other students when he uses a technique that they are not aware of. "When I'm trying to show a Korean student a move, I try to break down the technique into three steps since I know how to count to three in (Korean)," said Gonzalez. "The biggest lesson that I've learned is that martial arts has no language barrier." 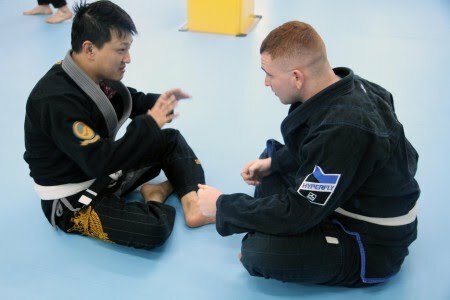 While David Bae, Hoon Machado daemyung region instructor, uses little English to teach his jiu-jitsu classes at the gym, he knows to emphasize certain points while checking the Soldier's form during drill exercises. He has run the gym for approximately two years and trained approximately eight Soldiers during that time. "The soldiers who come in here to train are actually going to need these skills to survive in combat," said Bae. "They need these skills to do their job so I take more care of them to actually learn it as opposed to kids who just do it as a hobby." Gonzalez emphasized the other aspects that training in jiu-jitsu has accomplished outside of the gym. He is convinced that martial arts affects many other aspects in a person's life. "I think with programs like combatives and jiu-jitsu, not only are (Soldiers) facing their opponent but they are also facing themselves," said Gonzalez. "If you have a strong connection between the mind and body, that effort is going to leak into other facets of your life. I think that it is an integral part in the total soldier concept, making sure that the soldier is not only strong in their body but also strong in the mind. That directly applies to being in the war zone, being on the battle field."